The twentieth century has been referred to as the Age of Anxiety. Similarly, the first decade of the twenty-first century ushered in a "culture of fear"---especially in a post-9/11 world. 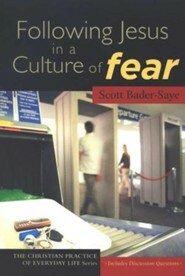 Scott Bader-Saye helps us counteract this destructive force in Following Jesus in a Culture of Fear. Divided into three sections (Diagnosis, Antidote, and Recovery), this work draws insights about fear from medieval theologian Thomas Aquinas. Furthermore, Bader-Saye stresses the importance of sharing our fears in ecclesial communities, where we can develop courage. Most important, Bader-Saye notes that a reclamation of God's sovereignty will help us reframe our lives; the doctrine of providence not only assures us that the fragments of our lives will cohere into a narrative unity but also demonstrates that God is our Provider. 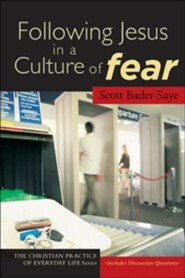 A timely and applicable resource, Following Jesus in a Culture of Fear will resonate with academics, church leaders, and church members. Instead of allowing your own or others' fears to motivate you, you'll be encouraged to forsake an "ethic of safety" for an "ethic of risk." This new way of living manifests itself in hospitality, peacemaking, and generosity. Each chapter includes questions for discussion. Through politics, marketing, news programming, and popular culture we are taught to fear, often in ways that profit others. But what does all this fear do to our moral lives as it forms (or deforms) our character and our judgment? Drawing on Christian scripture and tradition, Following Jesus in a Culture of Fear articulates a response to fear that resists an ethic of security in favor of fostering an ethic of risk. The Christian virtues of hospitality, peacefulness, and generosity are presented as the way to defeat the counter-virtues of suspicion, preemption, and control. 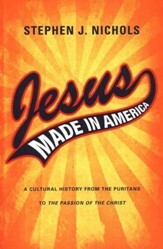 Pastors, students, and lay people will find this unique book both accessible and intriguing. Do not be afraid. We live in a time when this biblical refrain cannot be repeated too often. Both John Paul II in 1978 and his successor, Benedict XVI, in 2005 used these words to begin their papacies. Among all the things the church has to say to the world today, this may be the most important. No one has to be convinced that we live in fearful times, though we are not always sure what we should be afraid of and why. We suspect that our fears make us vulnerable to manipulation, but we find it hard to quell the fear long enough to analyze how it is being produced and directed for the benefit of others. One reason we are a more fearful culture today, despite the fact that the dangers are not objectively greater than in the past, is because some people have incentives and means to heighten, manipulate, and exploit our fears. Fear is a strong motivator, and so those who want and need to motivate others--politicians, advertisers, media executives, advocacy groups, even the church--turn to fear to bolster their message. I call this the "fear for profit" syndrome, and it is rampant. We have become preoccupied with unlikely dangers that take on the status of imminent threats, producing a culture where fear determines a disproportionate number of our personal and communal decisions. The sense of ever-increasing threats can overwhelm our ability to evaluate and respond proportionately to each new risk, thus we allow fear to overdetermine our actions. Scott Bader-Saye (PhD, Duke University) holds the Helen and Everett H. Jones Chair in Christian Ethics and Moral Theology at Seminary of the Southwest in Austin, Texas. He is the author of Church and Israel after Christendom: The Politics of Election. The latest volume in the Christian Practice of Everyday Life Series (What About Hitler? etc.) explores the tension between Christian ethical imperatives and the anxieties of the post-9/11 world. Bader-Saye, who is an associate professor of theology and religious studies at the University of Scranton, is primarily concerned with the impact that these anxieties are having on the practices of hospitality, peacemaking and generosity. Acknowledging that many of our fears are well grounded, he believes that the best way Christians can reclaim their ethical heritage is by pooling their risk at the local level. He cites Taize, the ecumenical French monastery, as an example of how pooled risk can counteract typical 21st-century fears and calls the practice of hospitality a "parable of courage in community." Anxiety and despair can also be opposed, he believes, through reclamation of God as providential parent. He writes, "Providence, at its heart, has to do with the conviction that our lives and our world constitute a coherent story, a drama, in which God and humankind, together, drive the story toward its proper conclusion." While some Christian groups may feel a certain obviousness to what he has to say, many, especially the mainline denominations, can learn much from this cogently argued and elegantly written volume. Copyright 2007 Reed Business Information. I'm the author/artist and I want to review Following Jesus in a Culture of Fear.